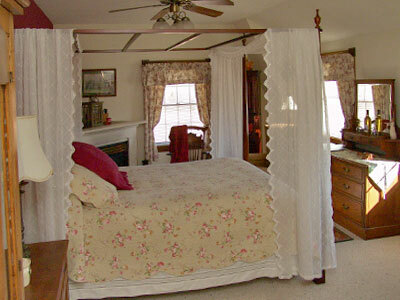 We proudly offer four comfortable guest rooms in a quiet country setting. Enjoy our relaxed atmosphere and the changing seasons of the vineyard. All rooms have a private bath, air conditioning and a fireplace. All rooms include a complimentary bottle of wine from our vineyard. Enjoy a full vineyard breakfast each morning. The Inn features a private entrance for guests. We offer complimentary internet access through our wireless network. Standard rate: $159 - $189. Check our specials page for discount offers. Call us to learn about unadvertised specials and weekly rates. Check availability and make reservations using our online calendar. 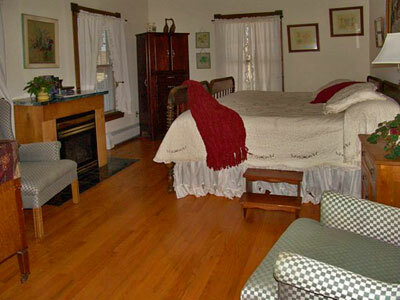 This upstairs room features a queen canopy bed, corner fireplace and dormered ceiling. Other amenities include whirlpool tub and large windows with panoramic views of the vineyard and surroundings. Freshly updated, the Fitch Room now features a queen bed. This upstairs room also features a corner fireplace and vaulted ceiling. Antique furnishings and Victorian appointments give the Fitch Room its unique. Panoramic views of the vineyard. Ideal for couples planning an intimate getaway. The Waterman Room - The Room With "The Bed"
This downstairs room features a colossal California King bed, fireplace and antique furnishings. 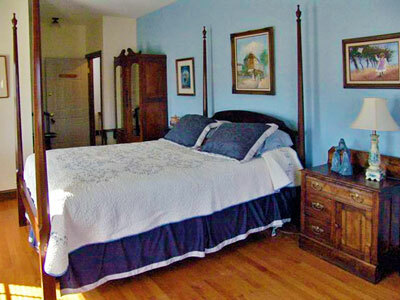 The King bed can be split into two bedsplease call for rates. The Waterman is a favorite to which many guests return year after year.